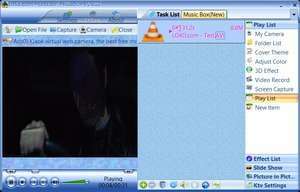 Kloak is a free virtual webcam application, video player and video editor for Windows. Kloak is an interesting program that can be handy when chatting on instant messaging programs and other video conferencing software; You can add one of many different effects to your webcam image in real time. The user interface of the program is pretty cramped but includes a number of features including video capture and recording, support for many different video codecs and more. The right panel provides access to all of Kloak's different features like video record, 3D effects, screen capture, cover theme and adjust color which can manipulate video. Version 0.920 is a freeware program which does not have restrictions and it's free so it doesn't cost anything. For security reasons, you should also check out the Klaok download at LO4D.com which includes virus and malware tests. Additional screenshots of this application download may be available, too.